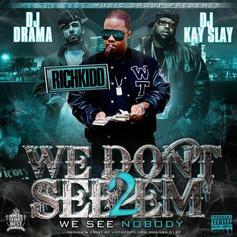 Listen to We Dont See Em 2 (Hosted by DJ Drama & DJ Kay Slay), the latest tape from RichKidd (WTB). It dropped on Monday, June 27th, 2011. RichKidd (WTB)'s future brightens with every new release, and We Dont See Em 2 (Hosted by DJ Drama & DJ Kay Slay) certainly isn't an exception. It's a fitting addition to a solid catalogue that RichKidd (WTB) has been developing since stepping foot in the game. We're excited to hear more.